Hortus Camdenensis | Phormium tenax Forst. Half hardy clump-forming perennial with upright, linear leaves to 3m, and red-purple panicles of tubular dull red flowers in summer. To 4m. [RHSE, Hortus]. 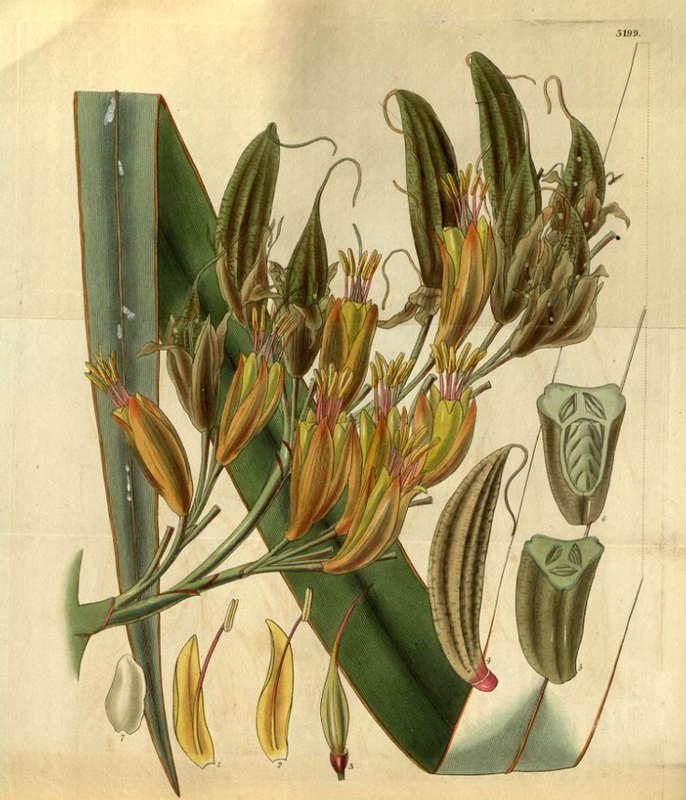 ‘This highly useful plant is one of the many important discoveries, for which we are indebted to the late Sir Joseph Banks; who says, in Cook's first Voyage, when speaking of the productions of New Zealand: "But among all the trees, shrubs, and plants of this country, there is not one that produces fruit, except a berry, which has neither sweetness nor flavour, and which none but the boys took pains to gather, should be honoured with that appellation. There is, however, a plant that serves the inhabitants instead of Hemp and Flax, which excels all that are put to the same purposes in other countries. Of this plant there are two sorts; the leaves of both resemble those of Flags, but the flowers are smaller, and their clusters more numerous; in one kind they are yellow, and in the other a deep red. From the leaves of these plants, with very little preparation, the natives make all their common apparel; and they also manufacture their strings, lines, and cordage for every purose, which are so much stronger than any thing we can make with Hemp, that they will not bear a comparison. From the same plant, by another process, they draw long slender fibres, which shine like silk, and are as white as snow: of these, which are also surprisingly strong, the finer clothes are composed; while of the leaves, without any other preparation than splitting them into proper breadths, and tying the strips together, they make their fishing nets; some of which are of enormous size. A plant, which, with such advantage might be applied to so many useful and important purposes, would certainly be a great acquisition to England, where it would probably thrive with very little trouble, as it seems to be hardy, and to affect no particular soil; being found equally in hill and valley, in the driest mould and the deepest bogs. The bog, however, it seems rather to prefer, as near such places we found it to be larger than elsewhere.” The seeds brought home by Sir Joseph Banks in 1771 did not succeed, but the New Zealand Flax was introduced to the Royal Gardens at Kew, through the medium of the same enlightened individual in 1789, and thence has been liberally distributed to collections in our own country and upon the continent.’ [BM t.3199/1832]. Listed in the 1845, 1850 and 1857 catalogues [H.184/1845]. The source of Macarthur’s plants is unknown but they were probably obtained directly from New Zealand.